It's known that red buttons are mostly used for dangerous actions. This makes sense and it's all great. But then some big companies come and start using them as primary buttons.. And not just any companies, I'm talking about companies known for caring about user experience and design principles, like YouTube or Netflix. I googled it but found no explanation why they do this or any type of justification. Could someone elaborate on this? Or do we all agree that this is a "because they can" situation haha? 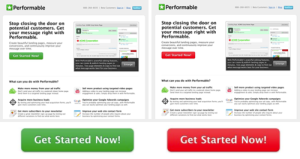 There are A/B tests that tell us red is more effective than green. But you have to ask why the A/B test swung that way. All we know really is that red was more effective because more people clicked on it. There could be a whole bunch of reasons, some centered around subconscious human behaviour, and some related to an actual physical difference. A straight A/B test between red and green buttons with a white label does not reduce simply down to 'colour of the button'. There is the contrast ratio to consider - white text on a red background has a higher contrast ratio than white text on a green button. Higher contrast ratios make for a more legible text, and therefore make it stand out more. Obviously we can't ignore the red=danger aspect, but people don't go round thinking 'I'm not clicking on that because it's RED and dangerous'. But what red might do is appeal to the subconscious to defer to the conscious mind in order to asses the situation for actual danger before continuing. The conscious analysis of a red submit button says "that's fine, it's just a submit button, it's not dangerous" or "it's ok, that's clearly just the brand colour". This surfacing of a situation to the conscious is an effective 'stop and think' step, the outcome of which is 'it's ok to proceed'. All the time, your subconscious is trying to process all the information you see, only deferring to the conscious when an automatic (instinctive or gut) reaction can't be made. The 'stop and think' step, paired with a positive assessment of the situation can be a more progressive step than a subconscious ambivalence. So yes, red probably makes a good primary button colour. However, if the CTAs on a page are such that they need to be compared for the best option, or for one that least likely leads to a loss, or that fights against one of hundreds of other cognitive biases, then the conscious mind is going to actually have to make a decision - not just to vett the content, but to resolve conflicts. That's when we get a bit confused. That's when people give up and avoid making a decision at all. So to clarify - red makes a good primary button colour in isolation. Start mixing it in with other colours in a similar context - even between pages - in a way that has no clear pattern or reasoning, and red will start to lose it's effectiveness. A curious thing happened at the end of writing this answer. I had in mind pictures of deep red buttons. I went to click on 'Post Your Answer' and stopped suddenly because I was expecting the button to be red! Had it been red I might have clicked it straight away because it was what I was expecting. This is a great example of the subconscious quickly learning what's ok, what's expected, whats normal right now, and what stands out as unexpected based on recent activity. Red makes a good primary button colour in isolation and providing that the user has not recently been given the opportunity to associate red with something negative, or to associate another colour as the positive. The opinions are mixed on this. Some studies show that red buttons can in fact increase conversion. Yet there's also research out there that says otherwise. The main takeaway point is: it doesn't matter. As long as you don't use both next to each other simultaneously, it will make no difference. As soon as you see both at once, you'll start making the red=danger, green=good connection. Conversion strength seems to not be based on color itself, but on color contrast. The CTA will need to stand out. That's why red scored better results in the below example. Consistency is the key. Red buttons are OK as action buttons as long as the style is consistent throughout the experience. There's a small price to pay for swimming against the current (red warning buttons): they will have to find another way to amplify warning color styles (ie black text on orange). User testing should verify if using Red buttons help or hinder the user. Hopefully, user testing can verify positive results before the site goes live and not after the fact. Alternately, if all-the-world uses the same color conventions -- I suppose I would be less inspired by the lack of diversity. IMO, I welcome the effort to promote the brand over blindly following universally color styles. Lot of a solid answers here already. Red buttons are usually associated with a negative (or dangerous) effect, however, if that is your brand's color, it can be used for primary CTAs. Keep in mind, it still needs to make sense above all else. Don't pair a green button next to a red button if the red button is the positive action you want the user to take - instead, use a neutral colors. Another suitable option here is to introduce ghost buttons. First of all, remember that red -as all colors- comes in different shades and degrees. There are cases where Red is used as a meaningful color to certain situations. Red in UI design yes has been known as danger, warning, alert most used color. However, Red also expresses love, passion, affection and power. Red roses, Red dress, Valentine...etc. It is an emotional color. I saw it used for situations related to tragedies. One example is to use the text "Send Love" on a red button to replace the word "Donate" on a green button. When I saw it, yes it alerted me (for all the right reasons), at the same time it related so much to the situation, and Encouraged me to click on it not refrain from doing so. So in that specific situation I found Red suits the situation more than i.e. Green! Not the answer you're looking for? Browse other questions tagged buttons design experience or ask your own question. UI Design / Flow - what should “Save” and “Cancel” do? Should “Delete” or other critical action buttons be emphasized or de-emphasized? Is it wrong to have your primary actions in red?